Some of our most popular tours are: Best of Romania Tour, Tour of Transylvania from Timisoara, Day Trip from Alba-Iulia or Deva, Family Tour of Romania, Jewish Heritage Tour of Romania and Photo Tour in Transylvania. The founder of the company, Daniel Rosca previously worked for Microsoft on Corporate Social Responsibility so when he established the company he wanted to promote the concept of responsible travel. 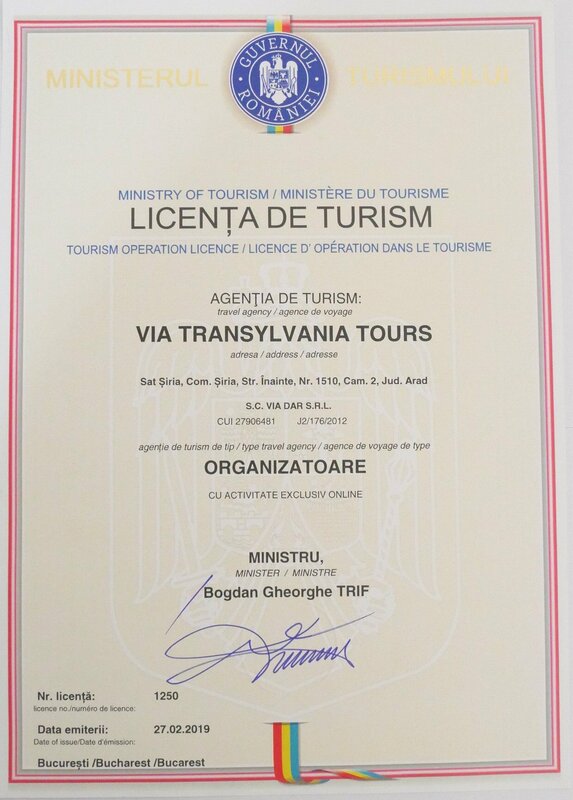 When the tour operator company was established in 2011, the geographic focus was on Transylvania region, thus the tourism license was provided by the Romanian Tourism Ministry under the name “Via Transylvania Tours” while the legal name is SC Via Dar SRL. With time, our tours expanded to all regions of Romania so this website was created to promote all of our tours of Romania. We organize tours for groups between 2 and 20 people from all over the world. Most of our travelers come from the United States, Great Britain, Australia, Israel and France, but also countries from Asia, Africa and South America. Since February 2017 our Romania tour operator company is also listed on TripAdvisor. 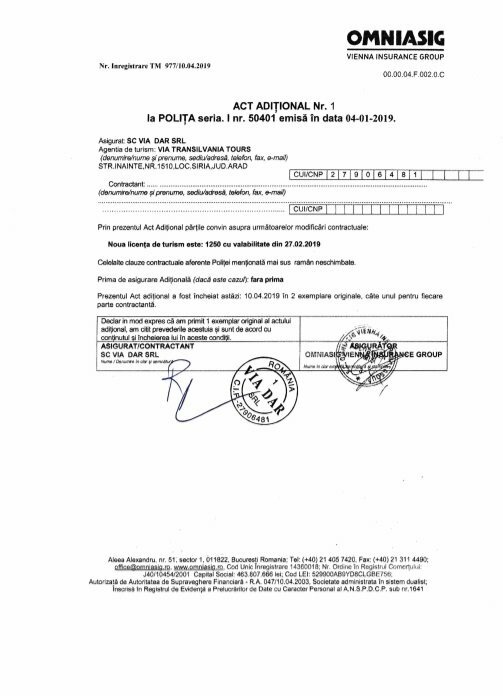 Below you can find the tour operator license and the insurance policy for the tourists in case of bankruptcy or insolvency of the company. 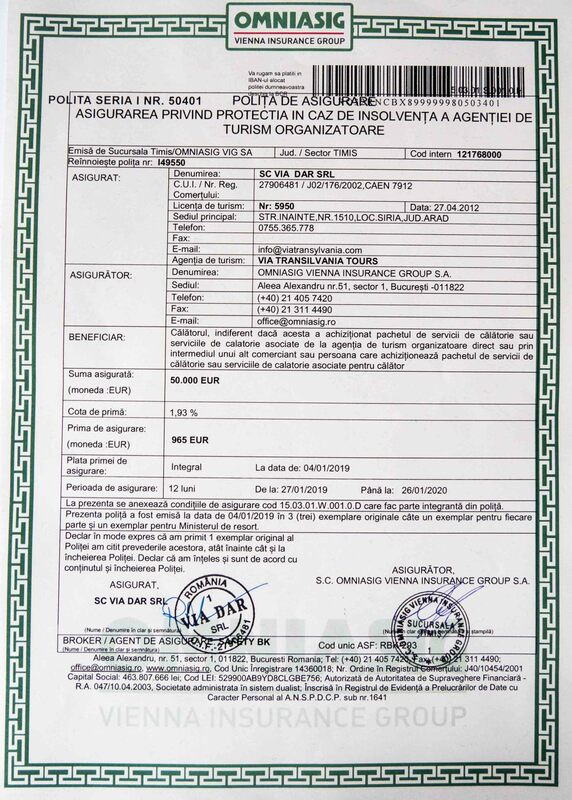 The tourism license 1250 issued in 2019 replaced the previous license that was issued in 2011 for our tour operator travel agency. We have also chosen to partner with other travel-related companies. For a detailed list, check our Partnerships page.